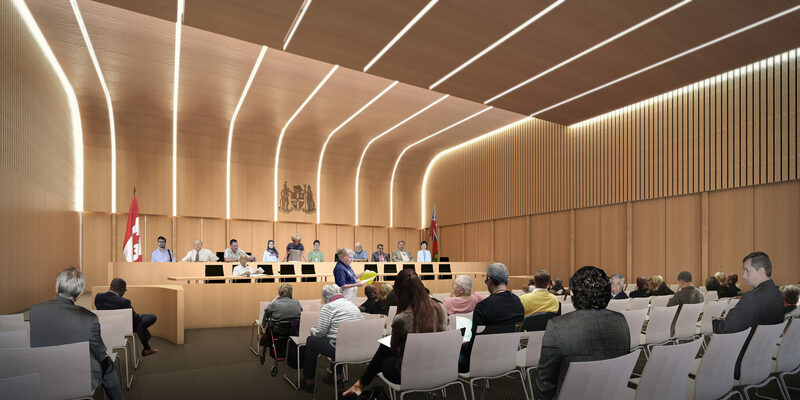 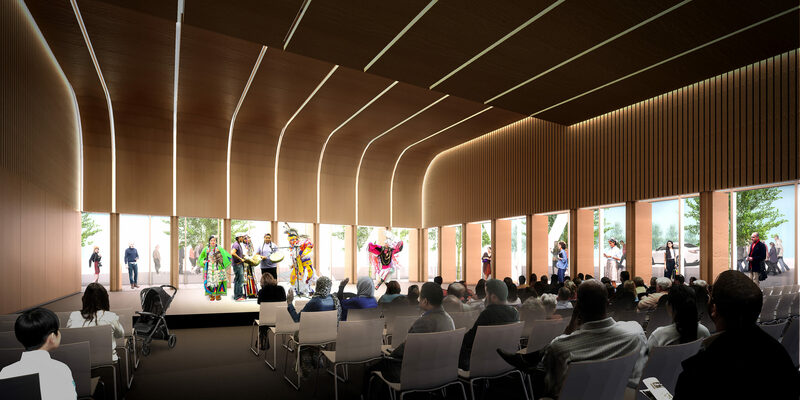 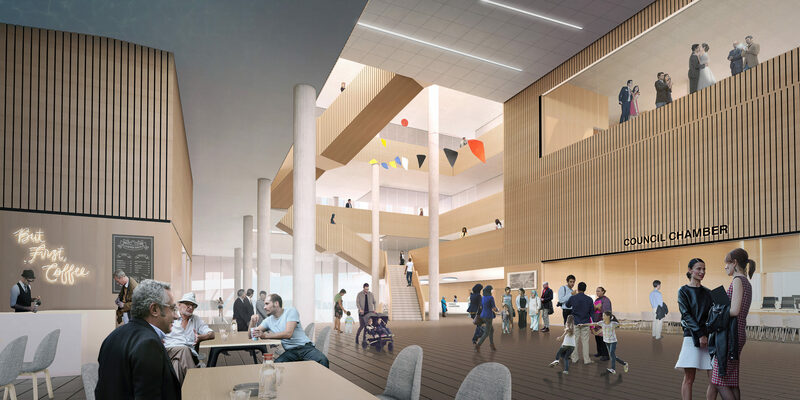 The proposed vision for the Etobicoke Civic Centre in the Westwood Theatre Lands district amalgamates civic, recreational, and workspace programs through the integration of generous park space into the public realm. 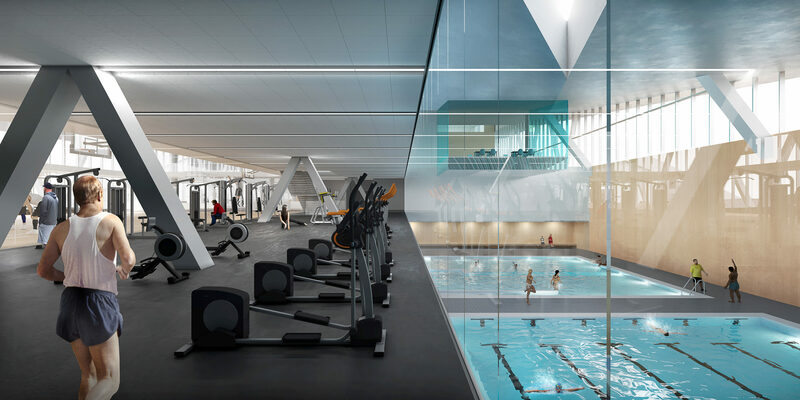 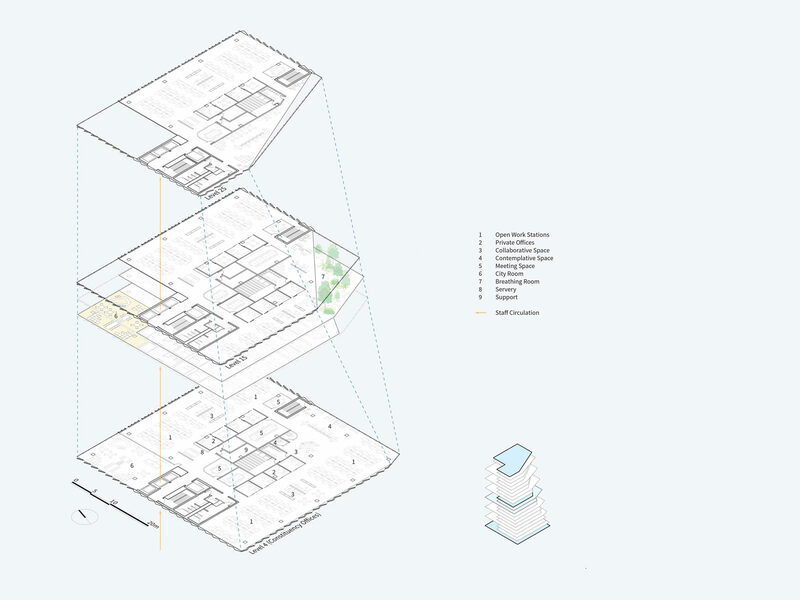 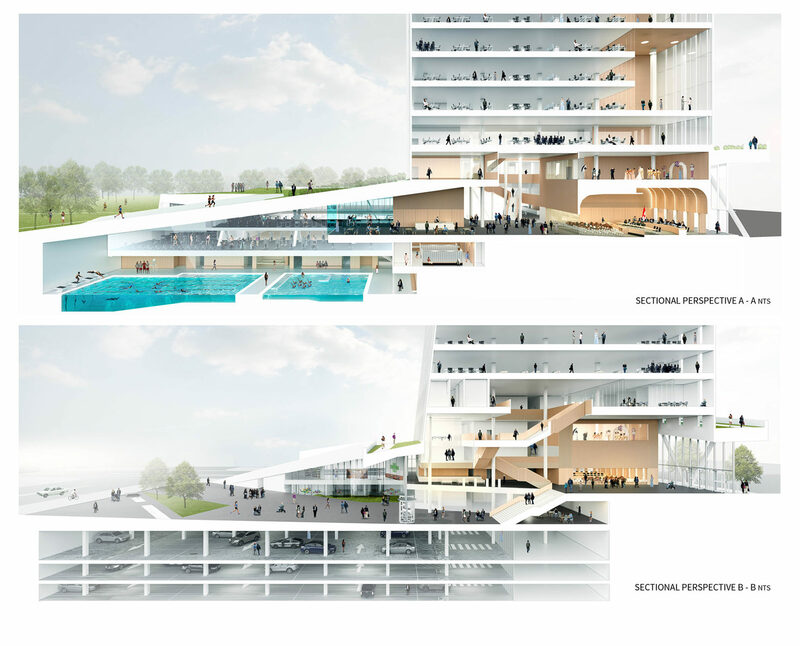 The proposal seeks to promote wellness not only at the level of the building and its occupants but also at the level of the greater neighbourhood. 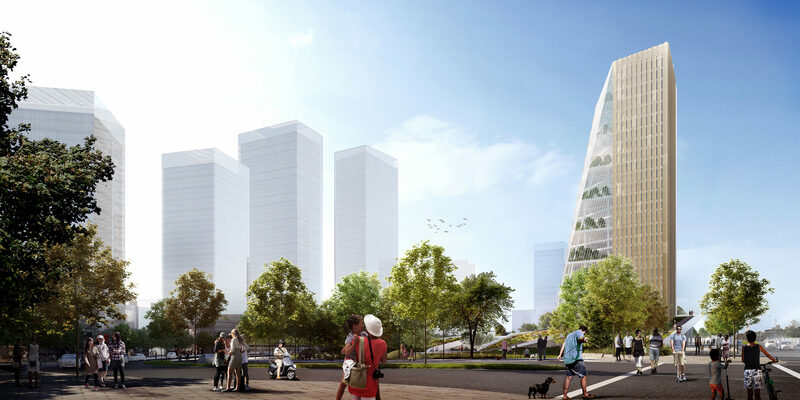 Tower and Landscape merge to facilitate a truly sustainable model for civic life that actively promotes community, health and wellbeing. 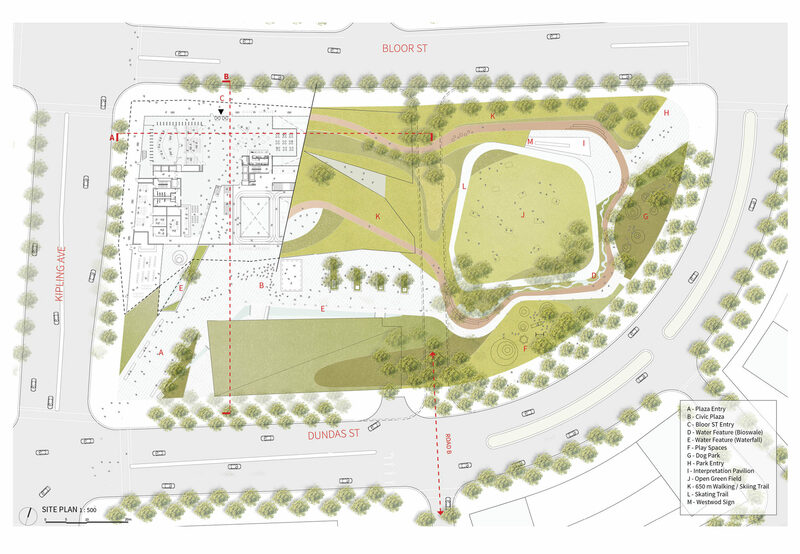 The design for the ECC maximizes open green space to expand and enhance the pedestrian realm by proposing the relocation of park space from another block and consolidating it with the Civic Centre development. 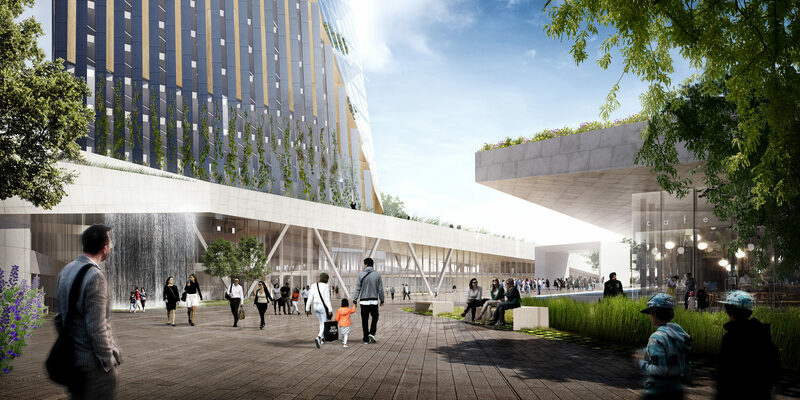 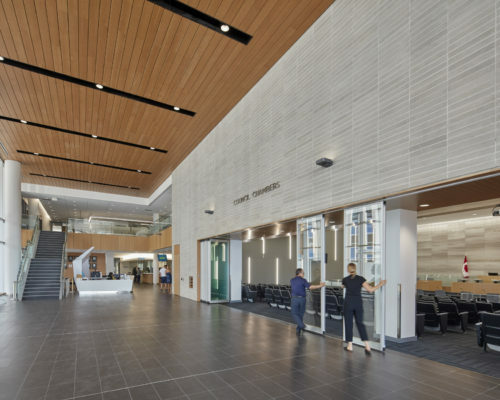 The open park space makes direct connections to the building through an extended occupiable green roof that shelters the recreational, library and daycare components. 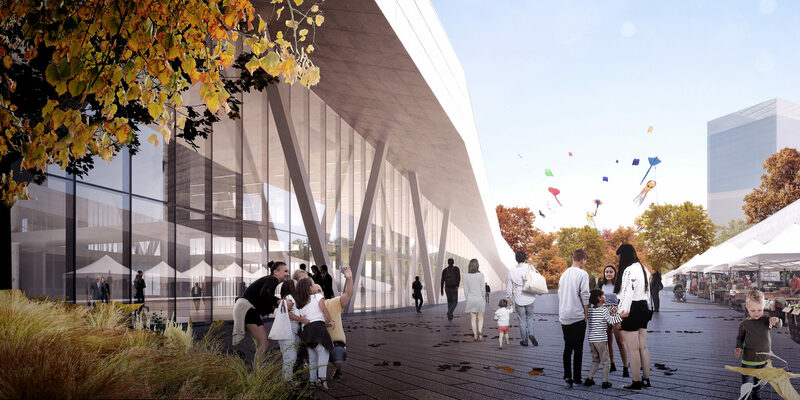 This contiguous public space allows the energy of the civic and recreational program to cross-fertilize creating a continuous civic landscape animated by the active programs. 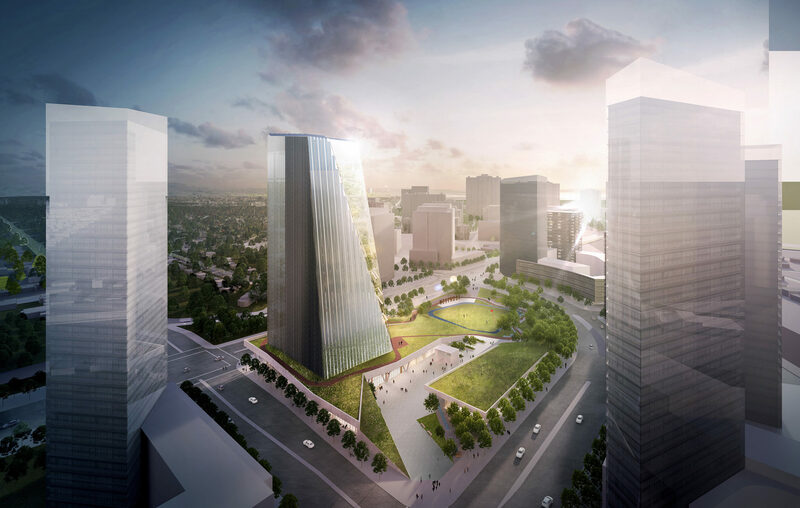 Tapering vertically and chamfered in plan, the tower presents a slimmer profile to the east in order to minimize shadows on the park and present a dramatic silhouette. 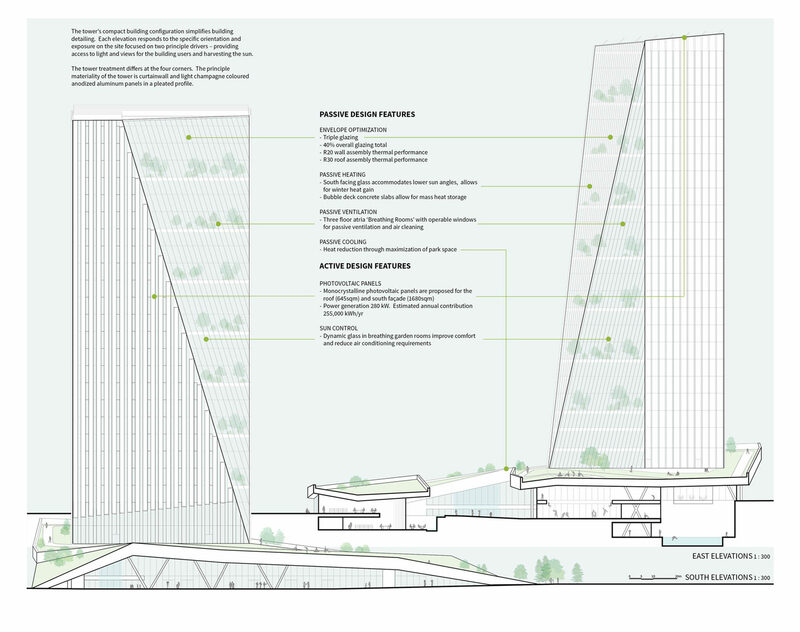 Responding to the proposed park, the SE corner of the building continues the landscape through a series of repeating vertical gardens – three storey glass atria called ‘Breathing Rooms’. 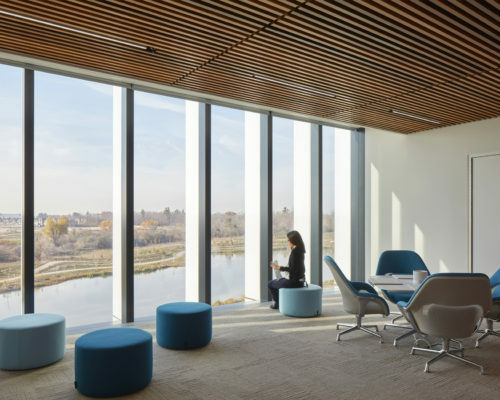 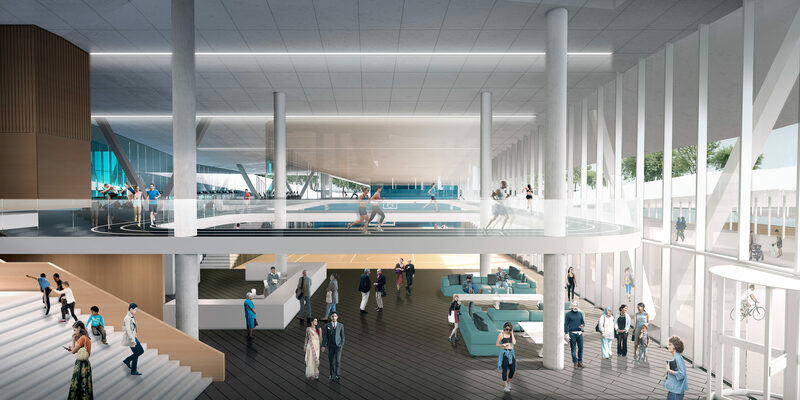 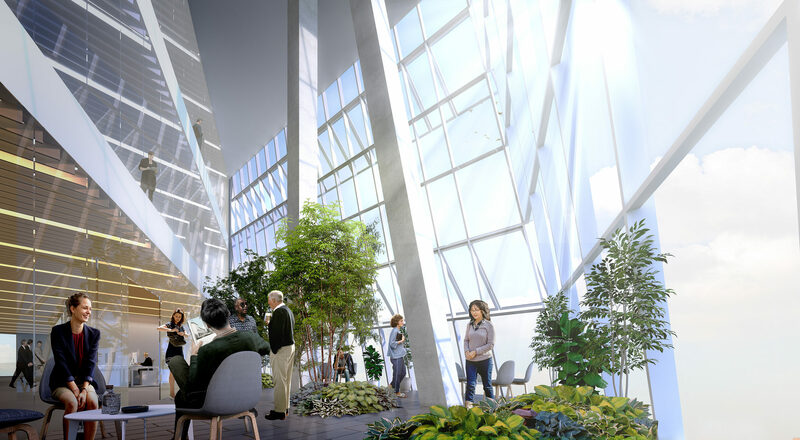 These present alternative working environments, contribute to the air quality in the tower and provide a connection to nature for the building occupants. 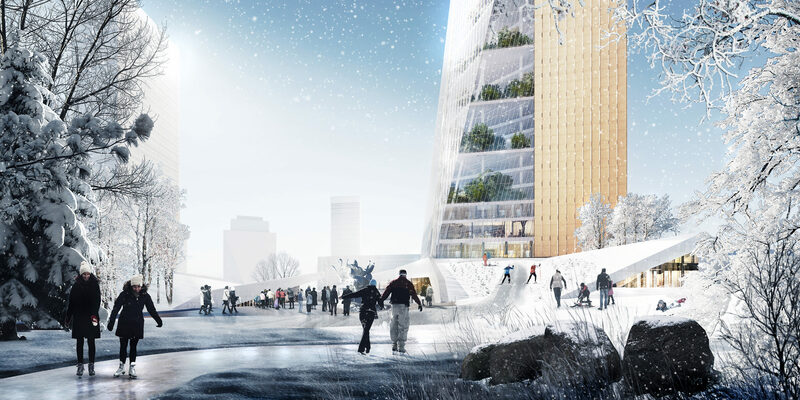 The tower also acts as a power source for the site with solar thermal and photovoltaic panels integrated into the south and western façades and roof. 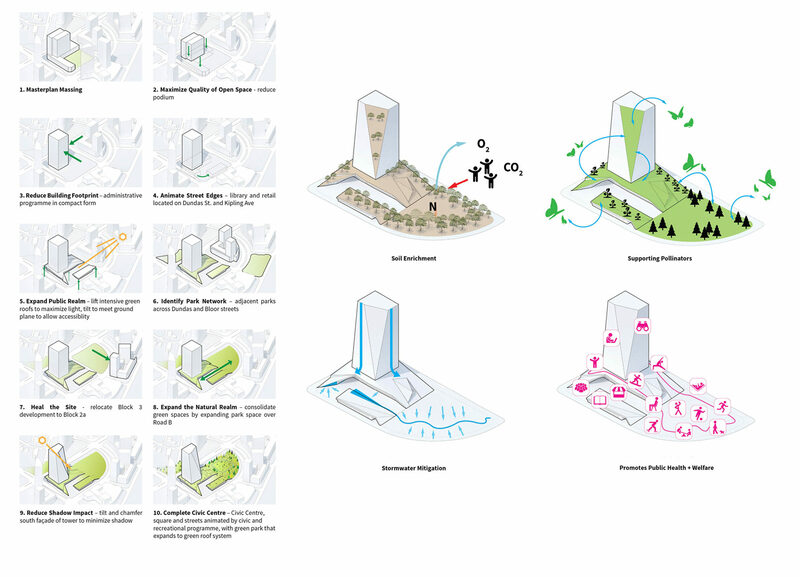 Together, the building, public square and park act as a social condenser, with space to allow the diverse population to gather, interact, learn and enjoy. 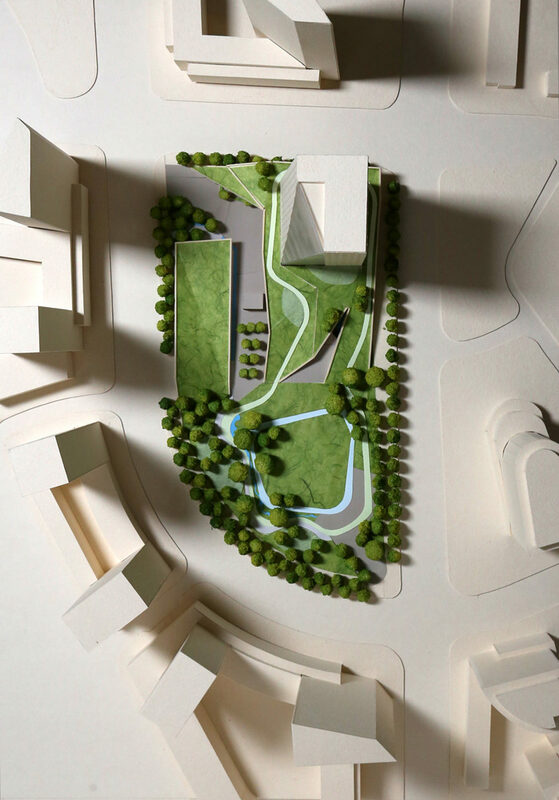 A clearing in the forest provides an outdoor space for active sport and public gathering, a green counterpoint to the civic square, and a 650 metre walking/skiing trail that circumnavigates the park and tower, providing rich views and experiences for the Etobicoke area’s growing population.